It’s a new week and after applying the recommendations in last week’s blog you have a better handle on sorting and organizing these items. What’s next? 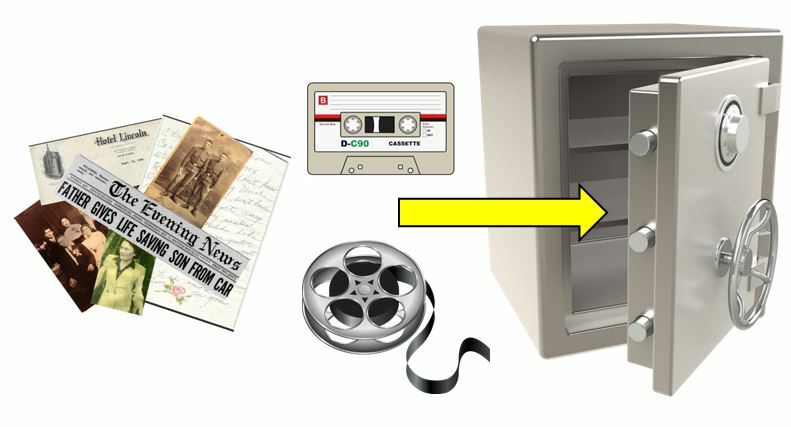 Perhaps your ready to convert these items into a digital format – Scanning, Ripping, and Rendering. This blog may seem out of sequence, but the following practice is done by many people – Trashing the original items after you have a copy on your computer. Remember to keep the originals in a safe place and never toss them away! This is very sad, but all to common practice with media such as photograph prints, film, tapes, documents, etc after they have become scanned or ripped into a digital format. The originals have advantages over digital copies and rapid changes in technology mean sometimes reusing the original is the best option. The best example of why keeping the originals is so important is the transition from 8mm film, VHS and digital video. When VHS became the standard and common in households many people had their old 8mm films converted to VHS tapes. The problem lies with the VHS tapes. They degrade over time and aren’t high definition. A new digitalized copy of the original 8mm film offers a much better quality then converting the same content from a VHS into digital format. And who knows what advances in technology in the future will enhance the originals, but not necessarily the copies we made. Check out GenealogyChris’s blog next week for tips on preparing to digitalize your items.